This recipe is part of a specially designed weekly meal plan. For a grocery list and other great recipes you can make in this meal plan, please click to the episode title above. You might also like these Ridiculously Good Roast Beef Recipes. 2. Sprinkle Oxo powder on bottom of large roasting pan. Add water and stir. 3. Flip roast, fat side down and make ½ inch slices ¾ of the way down, from top to bottom, leaving fatty surface intact. Turn roast fat side up. 4. Place in large roasting pan on top of Oxo mixture and sprinkle roast on all sides with spices. 5. Scrub potatoes. Chop into quarters. 6. 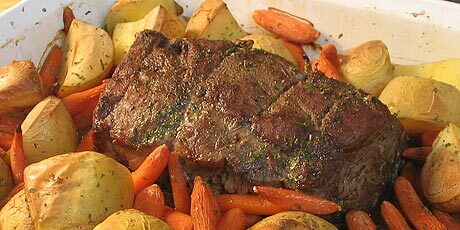 Arrange potatoes around roast along with baby carrots. 7. Bake in preheated oven for approximately 1 hour.